uvex South Africa and the Rainer Winter Foundation are making a difference in the lives of two hearing-impaired children at Eduplex, a unique school in Pretoria, South Africa. Through their annual sponsorship of the school fees for Thuto (aged 7) and Seabelo (aged 9), uvex South Africa and the Rainer Winter Foundation have provided these children, from disadvantaged backgrounds, an opportunity to receive a ­first-class education. New PPE regulation (EU) 2016/425 is no cause for alarm! Experience dictates that many questions tend to arise when new or revised PPE regulations are published: what changes are there? How will I or my business be affected? What deadlines are there and what will it all cost in the end? When it comes to hearing protection and the new regulation (EU) 2016/425, we can give the all-clear: first and foremost, it is manufacturers who must rise to this challenge. Who would have thought that hearing protection would be displayed in an art gallery? An artist from the United Kingdom has turned 6,000 uvex earplugs into an impressive art installation – powered by “big data” collected by her sleep tracker. An interview with Linda Simon, the woman behind “Sleep Pattern”. How uvex goes the extra mile for Denby Pottery, helping with employee safety, comfort and quality – and ultimatively removes their PPE concerns. A case study. Noise is annoying – and a real risk to your health! To the untrained eye, it may seem that fly fishing just involves standing in water trying to catch fish, which may then later be served for dinner. However, for anglers it is not just the fishing itself which is their main focus. Anglers often have a strong affinity with nature and treat it with great respect, apart from also bringing them enjoyment as they discover the many new fascinating things it has to offer. Our colleague Jürg F. from Switzerland is among them and this year embarked on a fly fishing expedition to Alaska with some of his angler friends. He talked to uvex about his experience and the role that uvex products played on his trip. uvex: Could you please briefly describe the hobby/leisure activity in which you use uvex personal protective equipment? JF: I am passionate about fly fishing and also help and support our club’s fish farming programme, which breeds and rears fish stocks for the region. This work has enabled me to try out a range of different products. The eagerly awaited trip to Alaska for salmon fishing was the perfect opportunity to test uvex all-weather clothing, gloves, hearing protection and above all the new uvex Polavision safety eyewear. JF: In the fish farm I am faced with virtually all common dangers, including noise pollution from lawn mowers and brush cutters, cleaning products for the pools that can irritate the skin and handling heavy grates that can fall on the feet, to name but a few. The greatest danger when fly fishing is being hit in the face or even eye by a hook. The uvex rubiflex S XG safety gloves are brilliant for pool cleaning, as they are comfortable, robust and provide excellent grip even when wet. For my feet, I find that the MACTREK GTX safety boots from Heckel are best. The GORE-TEX® membrane keeps my feet nice and dry, while the HPC toecap is great, especially in winter as they keep the cold out. I really feel the benefit of these features when I am dealing with water at sub-zero temperatures. I am also pleased I get to wear our “own” uvex Polavision 9231 when fly fishing. These protect my eyes excellently and the special coating prevents glare off the surface of the water so I find it easier to spot the fish. JF: I have always worn protective equipment for my hobby, but other products just aren’t the same. This also allowed me to personally experience the comfort and stability of our products for myself. My feet were neither too hot nor too cold and I don’t need to worry about injuring my eyes. 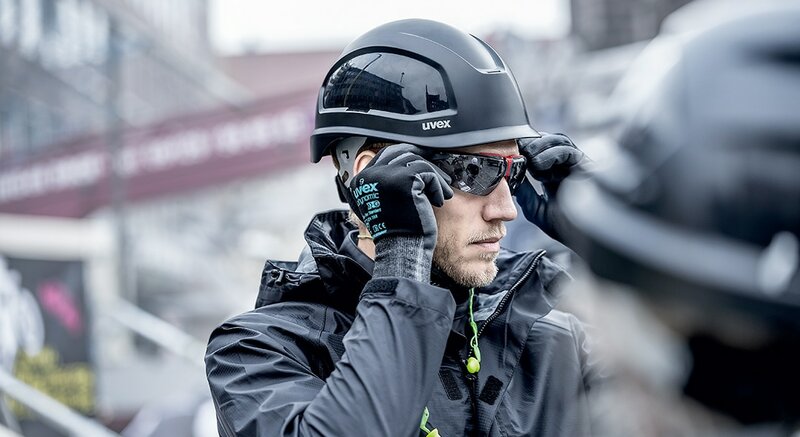 I can fully concentrate on my hobby, safe in the knowledge that I am protected by uvex products. We thank Jürg F. for talking to us and are pleased that uvex’s products were up to the task in Alaska. Please visit the gallery to not only see pictures of uvex products, but also stunning photographs of the wildlife and landscape in Alaska.